Edward Naijuka, an eye witness who operates a shop close to the accident scene, says amidst the confusion Kayondo went back to his vehicle and returned with a small hoe, which he used to assault Sseruga on the head. An angry mob has set ablaze a Prado vehicle registration number UAM 617D following a fight involving two motorists. The incident occurred this morning in Nansana Town council along Hoima Road after the two motorists ran into each. “We thought he was going to drive away but he returned with ‘akakumbi‘, which he used to hit on the taxi driver on the head,” Naijuka said. 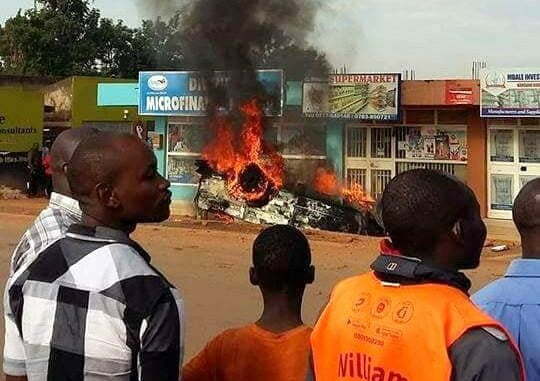 As a result, residents who were watching the incident descended on Kayondo and assaulted him before setting his vehicle ablaze. 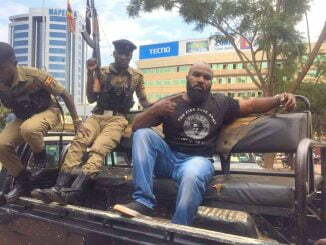 The Kampala Metropolitan Police Spokesperson, Luke Owoyesigyire, says police was called in to restore order, saying they managed rescue Kayondo from the mob. They also rushed Sseruga to hospital. Kayondo is being held on tentative charges of causing grievous bodily harm to Sseruga. “We have arrested the driver of the Prado and he is currently in our custody at Nansana police station. He was arrested by one of our detectives. The taxi driver was rushed by the residents to Hospital,” Owoyesigyire told our reporter.